It was almost exactly one year ago from today that I wrote my first post for Fabric Mutt. I can hardly believe it really. In some ways it feels like I've been doing this forever, and in other ways it feels as if I've just begun. Now...more than 200 posts, nearly 400 followers, and over 75,000 page views later...I'm so happy to say that I still love doing this. There's still so much to learn and try and see, and I'm terribly grateful to all of you who have shared with me your advice, encouragement, friendship, and laughter, making 2012 one of the most incredible years I've ever spent. Thank you so much. I had a lot of fun going through my flickr account today, reminiscing about the past year. I picked twenty of my favorite projects for the mosaic above, and if you're interested, you can see the rest on my new "finishes" page. Today is my 35th birthday, and my family has made it special as always. When I was young, I found it a little awkward to have a birthday so close to Christmas, but now I really enjoy wrapping up my year along with the one on the calendar. It's a great time to take stock of where I am and where I want to go, though I like to think of them less as resolutions and more as goals. I'd love to get a little braver when it comes to free motion quilting, and this past week I finally learned how to knit (more on that in a future post). I also have a few things I'm working on now which I'll be able to share with you next month. There are other ideas in the works, but they'll keep for today. For the moment, I'm happy with what's on my plate. To celebrate my birthday and the new year, I'm having a little giveaway today. My scrappy stash is growing faster than I can keep up with it, and I'd love to stuff an envelope full of goodies to send off to one of you. Leave me a comment on this post telling me what you're hoping to do in the next year -- and it doesn't have to be quilting related if you have other things on your mind today. If you're a follower -- old or new -- you can leave a second comment. International entries are welcome, just please be sure that your email address is included. I'll pick a winner on New Year's Day. One of my favorite poems is one that I first read in high school: "takes talent" by Don Marquis. It sort of reminds me of this whole blogging experience. Linking up to Craft Buds. Edited to add: linking up to Fresh Sewing Day too! I'm so grateful to Kelsey for organizing this wonderful event. Accountability is a beautiful thing, and I always find that it keeps me motivated and on track when I have things to do. Linking up to the 100 Day Hustle Final Review. Christmas was a perfectly lovely day for us yesterday, and I hope it was the same for all of you. I haven't had the chance to link up with Debbie's Tuesdays at the Table this month, so I figured that I'd better get this post written while I had the chance. Some of my all time favorite cookies are the simple but delicious Rich Roll Cookies from The Joy of Cooking. I always roll them out a bit thicker than the recipe calls for -- half an inch instead of a quarter. Rather than mess around with cookie cutters, I usually just pile the dough onto a piece of plastic wrap, roll it into a log, refrigerate it for ten minutes, and then slice and bake. The large amount of butter involved makes them taste almost like shortbread. We usually top them with buttercream icing and sprinkles for a fun treat -- my family loves them this way. I always bake a huge batch every Christmas, drizzle them with melted dark and white chocolate, and then sprinkle chopped Heath bar pieces all over them. Once they are cooled and packaged in cute holiday bowls or plates from Target, they make a perfect gift for friends and neighbors. Linking up with Tuesdays at the Table. My grandmother saw photos of my Weekender bag last month and became absolutely enchanted by Heather Ross's market piggy. So much so that she insisted that I make her a new lap quilt with that little character at the center of each block. I've been making hexagons out of scraps at night after the girls go to bed, and I pulled a bunch of these together to make four rosettes, each stitched to a square of yarn dyed linen. I used some fat quarters from Pat Bravo's beautiful Summerlove collection along with a Denyse Schmidt print as an outer border, and I think that all the fabrics work together to give the quilt a sweet vintage look. Kona Navy makes a simple frame, and I used a Joel Dewberry print for the backing. Grandma loved the quilt, which makes me ever so happy. And I have plenty of hexagons left over from my evening sewing, so I expect there will soon be a hexagon pillow -- or two -- in the works. I'll be taking a break from blogging for a few days so that I can spend the time with my family. I expect there will be plenty of baking, playing, laughing, singing, and "Christmas traveling" -- as my Bear likes to call our evening excursions to look at the neighborhood Christmas lights. It's my hope that all of you will have a truly wonderful holiday with the people you love. Merry Christmas! Linking up to the Let's Get Acquainted Link-up. It's just past one in the morning, and my eyes are seriously blurry from getting only a few hours sleep the night before. Between a house full of sick people (myself included) and projects which have kept me up into the wee hours, I'm running on the fumes of my last Diet Coke. Still, I wanted to share the finished quilt for my nieces, a feather quilt using Tula Pink's Prince Charming collection. Like so many other bloggers, I have been grieving this weekend for the victims in Connecticut and their families. Much has been said about the loss of the twenty small children who were murdered there, and I too have found myself cuddling my daughters while brushing away tears several times a day ever since. The horror of those little lives cut short so brutally is beyond anything I can understand. But I wanted to take a moment to remember those teachers who lost their lives that day as well. I spent nine years as a fifth grade teacher at two different schools, and one year as an assistant principal at yet another site. During the first week of school each year, I held the standard "here's what we do if a person with a gun walks into the room" discussion, and throughout each year I participated in the required school wide "intruder on campus" drills, all the while fighting the sick feeling in the pit of my stomach as I wondered how I could ever protect all my kids if such a thing really happened. In those ten years, I experienced several actual school lock downs, at least one of them because some criminals decided to make an escape across our campus before they were captured by the local police. My duties as an assistant principal included development of the emergency program, researching and implementing the steps we would take in any number of crisis situations. I remember attending a conference on school safety that was taught by a member of law enforcement where I learned more than I ever wanted to know about past episodes of school violence, particularly the 2004 Beslan school hostage massacre in Russia. The security portion of my work became one of the most distressing parts of my job, and I would often lose sleep because of nightmares about any number of emergencies happening on campus while I desperately tried to help rescue the children. I cannot tell you how deeply I honor the six educators who were killed on Friday while trying to protect their students. They bravely faced one of the darkest fears that I struggled with as a teacher, and they were faithful to their calling to serve their children even though it cost them their lives. Educators today -- public or private, teachers or administrators or specialists -- do their best to teach and love the children in their care, sometimes in the most difficult of circumstances and often with far fewer resources than they truly need. Tragedies like Sandy Hook just make the burden even harder to bear. Though I now stay home with my girls, my husband is still a middle school history teacher, and my sister's husband teaches middle school math. Several of my extended family members are elementary teachers, while my husband's brother works at a college back east. I would be lying if I said that I didn't worry about a school shooting happening on one of their campuses, because I do all the time. But I know that they can't stop doing what they're called to do because of the possible dangers. So I pray. Pray for the teachers in your life. Love them and support them and encourage them every chance you get. They need it more than you know. 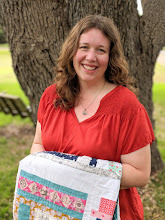 My brilliant friend Kristy of Quiet Play has another great pattern coming out for those of you who enjoy paper piecing. After seeing this Polaroid camera on her blog, I was absolutely charmed, and I was even more thrilled when she let me test it out for her. Discovering that I was out of black fabric didn't stop me -- I pulled out my fat eighth bundle of Architextures (which didn't include the black prints), and decided to go the navy blue route. It's a little busy, but I like it. I threw in a few blocks from the Polaroid block swap I did through Debbie's blog earlier this year, putting it all together to make a good sized mug rug. The back uses one of the great ledger prints from Architextures. That green strip at the bottom almost makes me think of a composition book. When I started working on the feather quilt for my nieces using fabrics from Tula Pink's stunning Prince Charming collection, I made one large feather, roughly based on Anna Maria Horner's pattern. When it was finished, it looked a little thick for my taste, so I trimmed the sides...once, twice, three times. Each time, I found that the trimmed pieces could be put together to make a new feather by themselves. I ended up with three feathers for the quilt, and a spare which has now become a table runner that I adore. I used a zig-zag stitch to applique it to a long piece of natural Essex linen. I quilted intermittent lines down the length of the piece, leaving the feather alone to make it stand out. The binding is linen too, so that all the focus will be on that strip of color in the center. The runner is backed in a print by Joel Dewberry. It's just over forty-three inches long, so it will run through the entire center of our table, with just enough room for my mother and I to have our place settings at the ends. 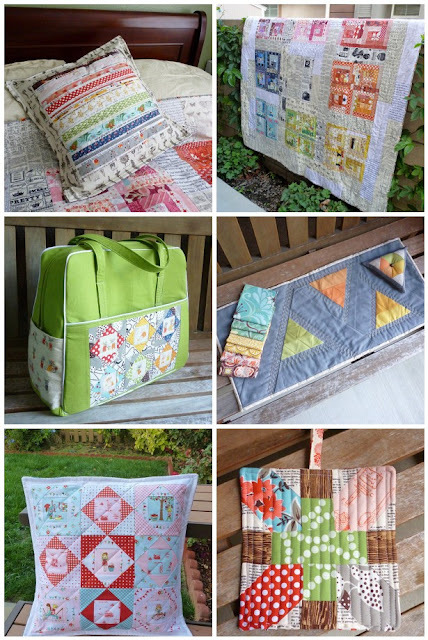 Scraps are becoming almost an obsession with me ever since I participated in the Scrappy Stash QAL through Ellison Lane Quilts. I'm coming to love the look of a scrappy project and the personality that comes from having so many different fabrics involved in its creation. Yesterday's pouch was a gift, but I saved a set of two-inch squares to use for a little pillow of my own. Two of the squares are actually half square triangle blocks made out of leftover tidbits from the potholder I made at the end of last month. I couldn't bear to throw them away, so I decided to try to do something with them. When I started working on this pillow, I figured that it would make a good home for them too. The back is a Cool Britannia print that I picked up on sale at the Fat Quarter Shop during their Black Friday sale. I love map prints of any kind. This little guy turned out to be about fifteen inches square. The grey linen border is quilted in echoing lines, each a half inch apart. I wanted to keep it simple so that the focus would be on the patchwork. It looks very much at home on our loveseat with the other pillow I made last month. I love seeing our collection grow...every pillow needs a buddy, right? There are several more projects on the list, but they'll keep for now. Hope you're all having a productive week! Linking up to Made by Me & WIP Wednesday at Freshly Pieced. This will be a week of Christmas sewing, and I'm enjoying the chance to work on some projects that have been on my mental to-do list for so long. Today's project is a quilted pouch that I made for a friend using some favorite scraps. I love making pouches like these because you can finish them in an hour or two, yet they are still such a personal, useful gift. The patchwork center is surrounded by gray linen, which serves as the backing as well, and the bag is lined with a lime green and navy Denyse Schmidt print. The material used for the strap is from Denyse's new line Fancy Free which I found at Joann's a few weeks back after seeing it on 1/4" mark for the first time -- I love the vintage look of this print. Do visit Chase's blog if you get the chance, by the way. 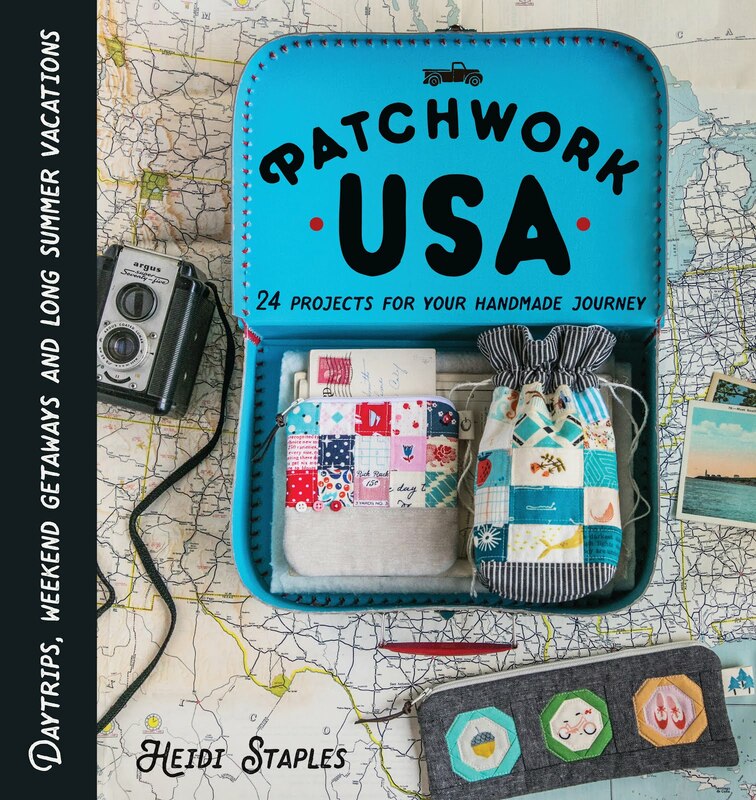 It's chock full of lovely pictures and projects -- I never come away without new inspiration. When I sorted the scraps for this bag, I set aside a second batch of scraps for another project which should be finished tomorrow. The great thing about having so many things to finish, of course, is that it gives me so many things to share! Linking up with the Let's Get Acquainted Monday Link-up and Fabric Tuesday. My husband is the man of a thousand hobbies. History, astronomy, photography, languages, geography, knitting, pasta and bread making (from scratch), and of course, his beloved gardening -- just to name a few. A few weeks back, we had a telescope visit our home for a few nights, and my husband asked if I could sew together some sort of bean bag to stabilize it. I grabbed a large scrap of Ruby Star Records and stitched as fast as I could to have it done in time for that night's viewing extravaganza. While this isn't the prettiest thing I ever made, I figure that it's good for you to see the random projects too. This bag is approximately eight inches in diameter and has three straps along its sides which end in velcro loops. If I had it to do over again, I would have made those straps at least twice as wide, but as I said, I was in a hurry. The loops hung on each leg of the tripod to balance the telescope in the middle. While it didn't make a massive difference in the viewing quality, it did help a bit. Once the telescope had departed, the bean bag immediately found a new position as a camera stabilizer for my husband's fancy camera. If it ever gets bored with that job, my youngest is more than happy to use it as a balance beam, which is where I rescued it from this afternoon. Speaking of my husband, tomorrow marks seven years since we walked down the aisle together as man and wife after meeting just over a year before that on eharmony -- yes, we're one of those success stories. I cannot tell you how grateful I am that God brought this man into my life. He's not perfect, but he is exactly the right man for me, bringing balance and perspective when I need it most. Take a conversation we had one evening a few weeks ago. I came into our room and collapsed on the bed before moaning, "I just realized today that I'm going to be thirty-five this year. Thirty-five!" I covered my face with my hands. "That's only five years away from forty. What happened??" My husband just looked at me with raised eyebrows. "You wanna know what happened?" He paused dramatically and then said with a huge smile, "You didn't die!" I stared at him blankly for a moment, and then laughed as he kept going, "This should be cause for celebration! You should be fist pumping right now and saying, 'Take that, Untimely Death!'" It was great to hear about everyone's favorite new fabric lines this week as I read your Sew, Mama, Sew! Giveaway comments. Among the top answers were Simply Color, Notting Hill, Salt Water, and Architextures, though there were plenty more to choose from. In fact I was so carried away by the fabric love that I found myself clicking the order button at Westwood Acres while I was up late the other night. When I saw this fat eighth bundle in Amanda's shop, I just could not resist. Any guilt I may have felt about indulging disappeared completely when I saw this stack arrive on my doorstep this afternoon. But you're waiting to see a winner here, I know. Out of 478 entries, the winner is Kristen who has a lovely blog at Milo and Molly. Do stop by and visit her if you haven't already -- there is some beautiful inspiration to be found in those pages! My thanks to all of you who stopped by to gush over fabric lines and also to those of you who were kind enough to become followers. I love having the chance to chat and share with you every week. You absolutely make my day. I had so much fun making my Go Faster Bag for the Happy Little Pouch Hop, that I decided to try a little experiment and make another one with just a few changes. This one is larger -- thirteen inches long instead of eight and a half -- with all of the pieces quilted before they were sewn together. I used one and a half inch hexagons for this one instead of the tiny half inch pieces that I put together for my first bag, and since I placed them side by side, I didn't need as many. I also made the loop large enough so that I can carry the pouch as a wristlet if needed. The inside of the bag is all Summersville for both the lining and binding. I would probably add another layer of canvas or interfacing along with the batting if I were to do this again -- it's sturdy but there's a bit more give in this version since the pieces are larger. This was a fun little project to play with over the weekend, and now I'm happy to have another bag for storing sewing projects on the go. A good thing, too, since I took another look at my project list today. I have a few Christmas presents that need finishing, and I'm excited to work on a few special items for the little reading area I just put together for my girls yesterday. I'll have more details on it all later on this week. It's hard to believe that Giveaway Day has come around again, courtesy of the fine folks at Sew, Mama, Sew. My name is Heidi, and I've been blogging here at Fabric Mutt for almost exactly a year. In the mosaic above, you can see the sorts of projects you'll find here from week to week. I'd love to have you come back for a visit some time, but I know that today there are other pressing matters at hand, namely free stuff. So let's get on with it! To enter, all you have to do is leave a comment answering this question: Which new fabric collection would you like to find in your stocking on Christmas morning? Personally, I have my eye on Type by Julia Rothman, Les Amis by Patty Sloniger, Architextures by Carol Friedlander, and Tsuru by Rashida Coleman-Hale. Yes, I know how hard it is to pick just one, so feel free to list as many as you like. The giveaway will run through Friday, December 7th, at 5pm, and it's open to everyone worldwide. Please be sure to leave your email address in your comment if you are a no-reply blogger so that I can contact you if you win. I'm looking forward to heading over to giveaway headquarters this morning to get in on the fun myself. It's always wonderful to sit down with a cup of tea and spend an hour or two visiting new blogs and, yes, drooling over all the goodies. ***This giveaway is now closed. Kristen at Milo & Molly is our winner. Thanks to all of you who entered!! When Elaine asked if I was interested in participating in the Happy Little Pouch Hop, I was thrilled to jump on board. While I had tried different pouches in the past as you can see above, I had not yet made a box bag, and this was a marvelous excuse to try the darling version from Tacha Bruecher's incredible book Hexa-Go-Go. If you've not picked up a copy of this gorgeous piece of eye candy, you will definitely want to click on that link and buy one immediately. The projects are stunning, creative, and yet somehow still incredibly doable. The Go Faster Box Bag jumped out at me on my first reading, and I was so excited to finally get the chance to give it a whirl. I would not classify this project as a quick finish -- for me that has to be something that I can make in two hours or less. This was something that I worked on here and there for just over a week. Hexagons are my favorite project to do at night after the kids are in bed, when my husband and I are relaxing with a good movie. The hexagons for this bag are only a half inch across. Being that tiny, they were a bit more fiddly to work with, so I took my time about it. While Tacha shows a wonderful variety of fussy cut pieces for her example in the book, I decided to use just one Japanese print I had on hand for half of my hexagons, and a red and white polk-a-dot print for the rest. Once the hexagons were sewn together and then hand appliqued to the sides of the bag, the rest came together fairly quickly. I had a wonderful time picking the fabrics for the bag, using favorite prints by Joel Dewberry, Denyse Schmidt, and Bonnie & Camille. I used fusible batting on the exterior pieces and interfacing on the zipper panels. The inside of the bag is a Michael Miller Retro Bunting print that I've had around for a long time. Sewing the lining around the edge of the zipper gave me flashbacks to my recent Weekender Bag experience, but it was a lot easier working with a project that was so much smaller. This little bag is only eight and a half inches long. I am perfectly delighted with how this bag turned out. It's sweet and sturdy, a wonderful size for small sewing projects, make-up, school supplies, or any other little extras you want to carry around with you. In fact, I had so much fun with this one that I immediately started working on a larger version of the bag which has quilted sides. I should have pictures for you in the next day or two. Linking up to the Let's Get Acquainted Monday Link-up and Sew Modern Monday. November was a wonderful month for sewing. It really was. One year ago this month, I made my first quilt. I can hardly believe it's been a whole year. I feel like I have finally figured out how to slow down and enjoy my sewing. 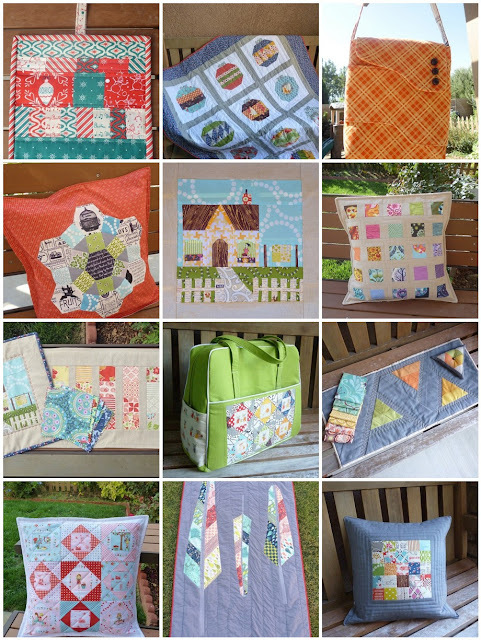 The projects this month were such a pleasure to sew. 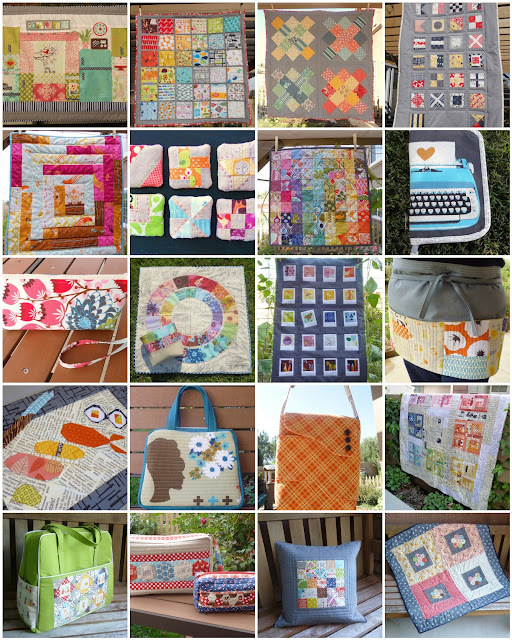 My Memory quilt and pillow at the top were a wonderful culmination of twelve months of scraps. Lori and I had a blast hosting The Long Weekend, and I finally got to experience all the joys and agonies of the fabled Weekender bag. I wrapped up my Modern She Made swap project, and even got to finish a few fun projects in the last week of the month. The Christmas decorations are up, the calendar is getting full, and I haven't started my gift shopping yet. It's a little overwhelming, but I'm determined to enjoy December this year. These times are too precious to just cross them off a list and move on. Wishing you a little peace in the middle of the bustle this month! The quiet of a rainy day is so soothing to my spirit, and yesterday was no exception. Even with three little active girls in the house, it was a remarkably peaceful time. Michael Buble's Christmas album crooned cheerfully in the morning, Bunny and I enjoyed watching White Christmas in the afternoon while Bear and Mouse napped, and I got the chance to do a little sewing. Over the next few months, I plan to both replace all our old potholders with new ones and cover all the family room pillows. Rather than do it all at once, I'm trying to just fit in a project whenever time or inspiration give me the opportunity. It's far less stressful, and I figure that this way there will be a lot more variety in my designs over the long run. I used Amy's tutorial for Japanese x & + scrappy quilt blocks which I've been wanting to try for a while. It's a great little block, and so perfect for scrap busting. I backed it in a Suburbia print that I've been saving for kitchen projects. It has a cute retro vibe going on that I love. 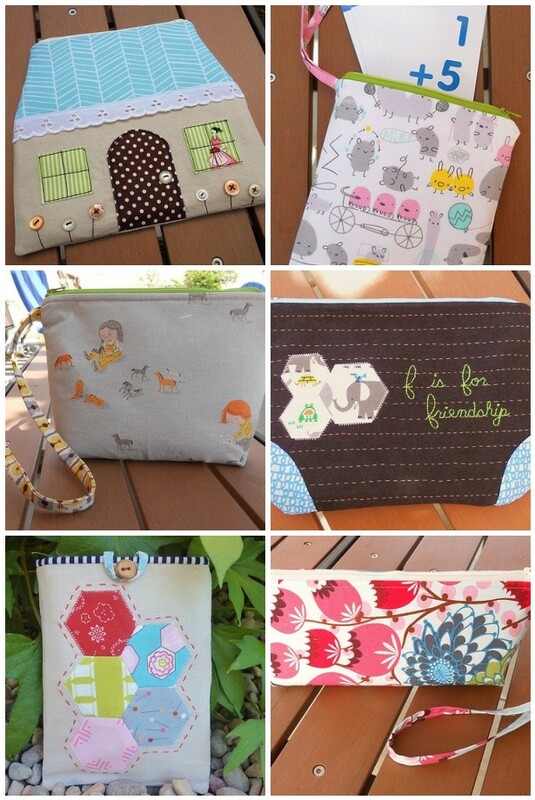 My other finish yesterday was my project for the Happy Little Pouch Hop which I'll be posting about on Monday. I enjoyed it immensely and can't wait to share it with you. 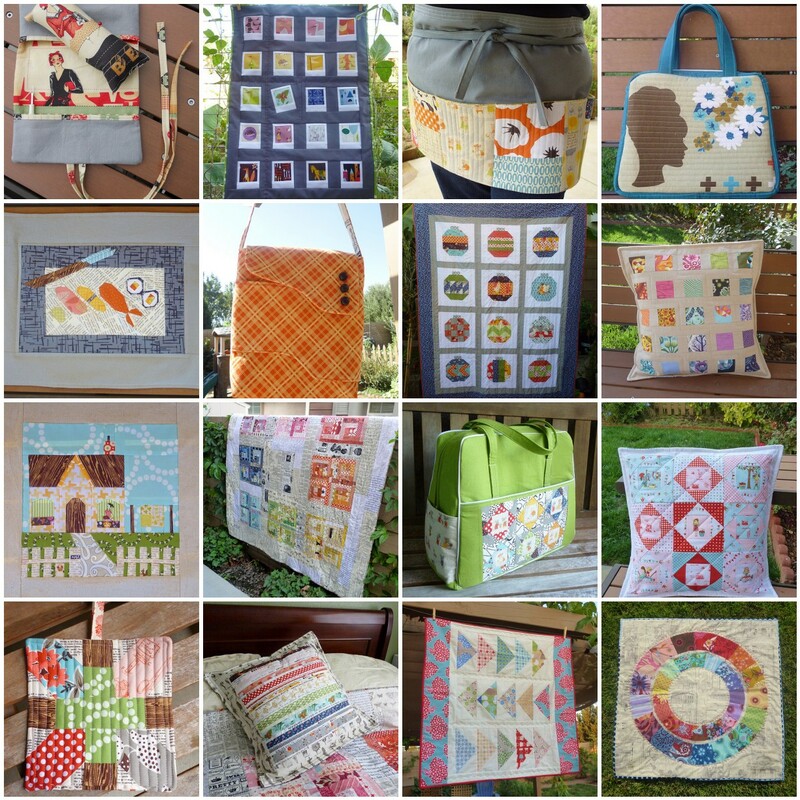 Look for two posts on Monday since it also marks the official start of Sew Mama Sew's bi-annual Giveaway Day. I'll be going through my stash this weekend to put together a little stack of goodies for one of you to win. This event is huge -- definitely check it out if this is your first time! I always enjoy seeing magazine spreads on Christmas decorating. It's so fun to get new ideas, and once in a while, I see something that I can actually use. For our family, though, Christmas is steeped in traditions and memories that rarely change. We use an artificial tree in our home -- asthma, allergies, and other concerns make it a necessity for us. This one is particularly special to me because it's the one that my husband and I used at our December wedding reception seven years ago. Over a decade ago, before Etsy mania took hold, my mother managed a small shop called Nana's Attic which sold handmade goods from all over the country. After my father became a pastor and she closed down the business, we saved some of our favorite holiday pieces including this Christmas tree skirt. The braided rag rug is actually a series of four upside down hearts sewn together to make a perfect circle. These little dolls, also from the shop, are such a sweet decoration. My girls love them, and I think they look so cute on the tree. As I've mentioned before, my mother is brilliant with cross stitch. This angel is one of several of her creations that we put on the tree each year. The little plastic apple was a Christmas gift from my sixth grade teacher, Ms. Bode. She was a tough teacher, but I respected her greatly. After she retired and I became a teacher myself, she gave her entire stash of bulletin board and teaching aides to me. Just a short while later, she passed away from a number of health issues, leaving behind no husband or children. I've always felt that it was important that someone remember her, and placing this little apple on my tree each year is my small way of doing that. We have some fun little vintage treasures like this one. I don't know the history of every one, but they've become a part of the family collection over the years. The angel at the top of the tree is one more find from Nana's Attic. I love putting it on top of that wreath of berries for a little extra color. But the biggest Christmas tree tradition in our family is the bow at the top of the tree. My parents got engaged thirty-seven years ago this December. That year my mom told her mother that all she wanted for Christmas was my dad. So on Christmas morning when my dad came to visit, my grandmother tied this red bow and pinned it to my dad's collar before sending him over to see my mom. It's been at the top of our Christmas tree every year since. The creche always hangs below it to remind us Who should be at the center of the celebration. I love this tree. I love everything it represents and all the people that it brings to mind. It may not be the flashiest or the most creative tree on the block, but there's love on every branch.